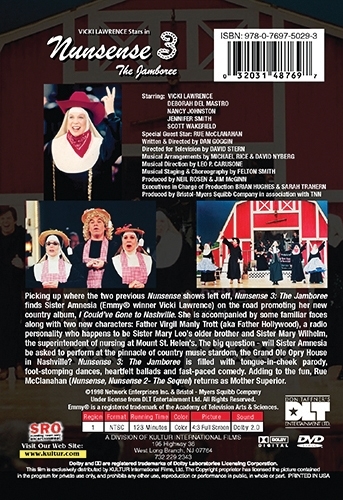 Picking up where the two previous Nunsense shows left off, NUNSENSE 3: The Jamboree finds Sister Amnesia (Emmy® winner Vicki Lawrence) on the road promoting her new country album, I Could’ve Gone to Nashville. She is accompanied by some familiar faces along with two new characters: Father Virgil Manly Trott (aka Father Hollywood), a radio personality who happens to be Sister Mary Leo’s older brother and Sister Mary Wilhelm, the superintendent of nursing at Mount St. Helen’s. The big question – will Sister Amnesia be asked to perform at he pinnacle of country music stardom, the Grand Ole Opry House in Nashville? NUNSENSE 3: The Jamboree is filled with tongue-in-cheek parody, foot-stomping dances, heartfelt ballads and fast-paced comedy. Adding to the fun, Rue McClanahan (Nunsense, Nunsense II – The Sequel) returns as Mother Superior.